“Page Parker Family, circa 1887,” braddockheritage.org/, accessed April 24, 2019, http://braddockheritage.org/items/show/161. Page Augustus Parker and Matilda Gibson Parker and their daughters, Maude, Molly, and Alice, circa 1887. 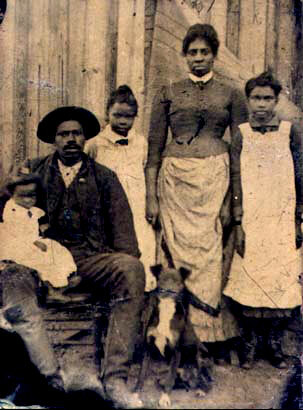 The couple took over the blacksmith shop founded by Moses Parker, father of Page Augustus, and his partner, Horace Gibson. The blacksmith shop on the corner of Little River Turnpike and today's Prosperity Avenue served travelers between Alexandria and points west. By 1878, the Gibsons and Parkers owned 400 acres of land that formed Ilda, a community of shops and a church probably named after Matilda Gibson Parker. Hareem Badil-Abish photos are copyrighted and may be reproduced or otherwise used only with written permission of the family of Hareem Badil-Abish.